Vietnam, a country on the Indochina Peninsula in Southeast Asia bordered by People’s Republic of China (PRC), Laos, Cambodia, and the South China Sea has a total land area of 128,565 square miles and a population of over 89.5 million. Vietnam is mostly mountains carrying dense tropical forest and hills. Its economic growth since 2000 has been outstanding and analysts predict that the country is on track to maintain that growth rate. The major sectors of its equitable economy are agriculture (rice, cashew nuts, pepper, cotton,coffee, tea and seafood), manufacturing, high-tech industries, and oil. The government gets full credit for reducing poverty in the country by supporting the poor in education and health issues and by investing in poor remote areas. In fact, this policy is being implemented by other poverty ridden countries. September through January is considered a good time to visit Vietnam. Visitors descend in droves upon Vietnam. 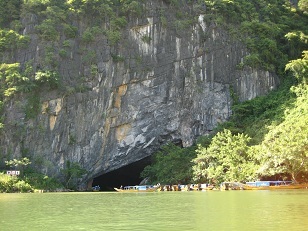 The major attractions are its two World Natural Heritage sites of Halong Bay, and Phong Nha-Ke Bang National Park. Other attractions are its biospheres - Can Gio Mangrove Forest, Cat Tien, Cat Ba, Kien Giang, Red River Delta, Western Nghe An, its cities – Hanoi, HCMC, Saigon, Hue and its coastline Nha Trang. Its cuisine is very healthy with very little oil and plenty of vegetables. Pho (rice noodle soup) is their staple and is based on rice, soy-sauce and fish sauce. Lonely Planet Vietnam Country Guide 978-1741791594 $17 Best guide for Vietnam. The first 80 pages is background and practical information. It is followed by chapters on Hanoi, Northeast Vietnam, Northwest Vietnam, North-Central Vietnam, Central Vietnam, South Central Coast, Central Highlands, Ho Chi Minh City, and Mekong Delta. Vietnam Travel Map 978-1553414599 $11 1:1,000,000 Scale. Includes inset maps of Central Hanoi, central Ho Chi Minh City, Hue and Region, and Phu Quoc Island. The first stamps of Vietnam were a set of thirteen stamps released between June 6 and October 23, 1951. The set (Scott #1 to #13) catalogs for around $250 MNH and around $12 used. The designs show Bongour Falls at Dalat, Imperial Palace of Hue, Lake in Hanoi, Temp in Saigon, and Emperor Bao-Dai. Northern Vietnam was partly controlled by communist Viet Minh fighting the French in a guerrilla war at the time. Independence was proclaimed on September 2, 1945. French were finally defeated in 1954 when Vietnam was partitioned at the 17th Parallel. During the interim, a number of Viet Minh stamps were issued. Viet Minh was a communist liberation movement under Ho Chi Minh. The first Republic of North Vietnam stamps were issued between 1951 and 1955 showing a portrait of Ho Chi Minh and a Map of Vietnam. The set (Scott #1 to #3) catalogs for around $40 MNH and around $12 used. North Vietnam issues from the 50s and 60s are highly valued with some sets cataloging into the 100s. Chief among them was a set of four stamps released on November 3, 1956 showing the Guerrilla Leader Mac Thi Buioi. The set (Scott #43 to #46) catalogs for around $650 MNH and a little more for used. A couple of South Vietnamese issued in 1955 and 1956 also enjoy high valuation. The sets (Scott #30 to #35 and #39 to #50) catalog for around $130 and $85 respectively for mint and around $12 and $8 respectively for used. The first set was issued for the first anniversary of the flight of the North Vietnamese and shows refugees on raft design while the latter set shows a portrait of President Ngo Dinh Diem. President Diem and his brother were executed in 1963 in a coup supported by the US – USA’s relationship with Diem broke down following the Buddhist crisis with Diem unwilling to bend. A set of four stamps released by North Vietnam on October 30, 1973 to mark the 4181st US Warplane shot down. The set (Scott #714 to #717) catalogs for around $8 MNH and around half that for used. North Vietnam has issued a number of stamps during the period till 1973 in the same theme and they generally catalog for a slight premium over regular issues. It is a good collectible theme. North Vietnam fought against the military of South Vietnam and its anti-communist allies (USA) in a protracted war during the period from 1959 to 1975. At the end of the war, South Vietnam was conquered and the North and the South merged to form the Socialist Republic of Vietnam on July 2, 1976. A set of six stamps released on January 10, 1983 showing Sampans. The set (Scott #1248 to #1253) catalogs for around $8 MNH or used. An imperforate variety sells for a little more. The designs show Sampans Docked, Sampans with striped sails, Sampans on Red River, Sampan with white sails, Sampan with patched sail, and a Fast Sampan. A set of seven stamps and a souvenir sheet released on July 10, 1993 showing Asian Architecture. The set (Scott #2464 to #2470 and #2471) catalogs for around $8 MNH or used. The designs show landmark buildings from Thailand, Indonesia, Singapore, Malaysia, Cambodia, Laos, Brunei, and Thai Binh of Vietnam. A set of three stamps released on February 1, 2003 showing Landscapes. The set (Scott #3169 to #3171) catalogs for around $2 MNH or used. The designs show Rung Cao Su of Binh Phuoc, Ao Ba Om of Tra Vinh, Mot Nhahn Song Rach Gam-Xoai Mut of Tien Giang. The first coins of Vietnam were cash coins (cast round coin with a square hole) issued under the Dinh Dynasty in the 10th century AD. The coins continued to be used till 1945 when they were valued at around 500 or so cash for one piaster under the French. Socialist Republic Standard Coinage debut in 1976 with the introduction of Aluminum Haos showing Arms in Obverse and Denomination in Reverse. The issues trade for about $10 in UNC. Gold Milled Coinage was introduced in 1841 when gold cash coins denominated in Tiens were issued. They enjoy a good premium over bullion value. Vietnam started issuing low mintage proofs from 1989 primarily for the numismatic market. Coins $1 and up Common UNC Dongs starts around $1. Cash Coins from the early eighteenth century starts around $10. Recent Commemorative Silver Proofs starts around $30. Low Mintage Silver Proofs, Early Silver Coinage, etc start around $50 and go well into the 100s. Paper Money $1 and up Common UNC Dongs starts around $1. High Value UNCs, Consecutive Serial Number Banknotes with 5-pieces or more, etc start around $10. Rare Emergency Notes from the 1950s, Large Notes from the 1960s in AU, etc start around $50. Bundles, Rare UNC Specimens, etc go well into the 100s and 1000s depending on rarity. Silk, embroidered cotton, lacquer-ware, bamboo items, wooden carvings, art and baskets are typical souvenirs. Militaria $1 and up Military patches start around $1. Vietnam era military jackets, Superior warrior medals, hats etc start around $40. National Order of Vietnam Grand Crosses, Vintage Wooden Military Equipment Models, War Cruise Book Logs etc start into the 100s. Minerals and Gemstones $10 and up Large Spinel, Calcite, Zircon etc crystals start around $10. Raw Red Ruby Crystals in the 15ct range start around $40. Transparent Aquamarine crystals start around $40 and can go into the 100s and into the 1000s for larger ones. Art $10 and up Vietnam War Photos start around $10. Political Cuban Posters start around $40. Large Vietnam War Propaganda Paintings start around $50. Original Works by KHong, Tang Lao, Chris Monson etc go well into the 100s. Antiques $10 and up Vintage Maps start around $10. Vietnam Tribe Cross Stitch Embroidery start around $25. Spherical Bronze Opium Weights, Champa Glass Beaded Necklace, etc start around $50 and go into the 100s. Dong Son Culture Bronze Bells, Bracelets etc go well into the 100s.